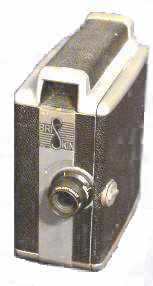 This movie camera was produced in 1947 (tyhe official catalogues say 1950i). It was equipped with a lens Wollensak Cine Raptor 1:2,5/13mm. The body is covered with black leather. 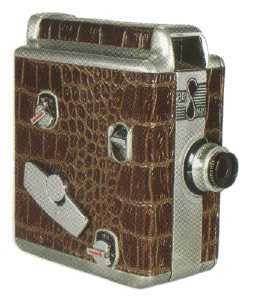 There was another camera, covered with artificial crocodile. Its weight is kg. 0,700 and its measures are the following: 54x117x110 mm. When it was produced, its cost was 79,95 dollars. The body is covered with artificial crocodile. Its weight is kg. 0,700 and its measures are the following: 54x117x110 mm. When it was produced, its cost was 79,95 dollars.